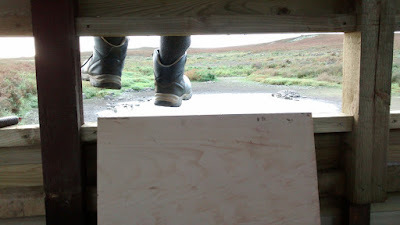 This week the Friends of Skomerand Skokholm have been working hard to rebuild the hides at North Pond and Moorey Mere. The work party group split into two teams (4 at Moorey Mere and 2 at North Pond). So far some friendly competition has developed between the two groups: to see who can finish the hide first! Four days in and the North Pond team is in the lead with only the windows to make (estimated half a day of work left), and the Moorey Mere team is just slightly behind with the windows, floor and benches to finish (estimated 2 days of work left). By Friday, the hides should be finished and ready for public use again. So come along to spot the migrant birds in our lovely new hides before the island shuts for the season! Hopefully all their hard work will pay off and the hides will still be standing strong after the winter winds and for lots of years to come! Many thanks go out to Howard, John, Rob, Ronan, Peter and Steve for making the hides, to the Friends of Skokholm and Skomer in general for donating the hides and the volunteers for hauling all the wood up the dreaded steps from the landing! If you would like to support the work we do on Skomer why not become a member of the Friends. For more information click here. And many thanks more go to our lovely Long-term Volunteers Alice and Cerren who did the cooking for the work party! Well done girls! She is the Island's daughter. Her songs have brought her. In foam and soft commotion. It's no secret that I adore the Grey Seals that spend at least part of their lives in Skomer's waters. 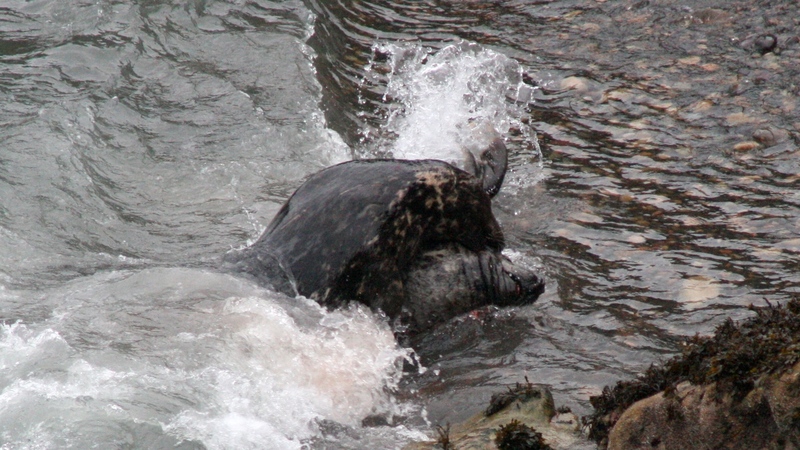 The pupping season has begun and since beginning of August 51 seal pups have been born. When Grey Seal pups are born they wear a white coat which they moult into the adult pelage after three weeks. They look very cute when they are lying quite helplessly on the beaches waiting to be fed. At birth they weigh between 12 and 20kg but they soon turn from an elongated looking creature into a balloon shaped one and then weigh 60 or more kilograms. They feed on very rich milk with a fat content of up to 60% (butter has a fat content of 80%) and gain nearly two kilograms of weight per day. The males are massive, their skin is covered in scars, the flesh around their necks lies in folds and they look truly scary. When they fight with each other, for the right to mate with the females on the beach, they grunt and bite often drawing blood, churn up the water and make pebbles fly. The females are beautiful sleek animals with dark shiny eyes and smooth skin. Their fur can show the most amazing patterns and they are caring and gentle with their pups. However they become fearsome warriors when their offspring is in danger. Every year, guests come to Skomer to take part in the ‘Shearwater experience’ and learn more about these incredible birds and their extraordinary lives out at sea, on the largest colony of Manx Shearwaters in the world. An amazing 316,000 pairs breed on Skomer, with the birds returning in early March and staying until late September. It all starts on the first night with a talk from the Oxford University researchers, from the Oxford Navigation Group, on the life history of Shearwaters, the historical research on these amazing navigators and also the current research being carried out by the team from Oxford. With the help of a volunteer from the Friends of Skokholm and Skomer we then head out on a night time walk to witness the Shearwater chicks out of their burrows, practicing their wingbeats and maybe, if you’re lucky, taking their very first flight. Red lights are best for the Shearwaters and as a bonus it doesn’t hinder your night vision so if it is a clear night, the stars can be incredible too! As part of Shearwater Week, guests are also invited to weigh chicks with the researchers on the second day of their stay. There’s around 60 chicks to weigh and you can get as involved as you like, from carrying, weighing or even giving it a go at getting the chicks out of the burrows. This chick still has quite a lot of down left around the neck and belly, which some people like to see as the Shearwaters trousers. It’s difficult to make out, but this chick weighs 455g. Adults weigh between 400-450g and chicks can weigh up to 550-600g at their heaviest! Chicks will then lose the excess weight in the build up to fledging. Shearwater Week guests lined up on the research colony at North Haven, ready to weigh chicks. It’s amazing to think that some of the chicks that fledged during the first few days of Shearwater Week are now probably most of their way to their wintering grounds off the east coast of South America, 10,000km away. How do they navigate? I hear you ask. You'll have to attend next years Shearwater Week to find out. Bookings for next year’s Shearwater Week will open on 3rd October for members of the Wildlife Trust of South and West Wales, and 17th October for non-members. Shearwater Week will run from 22nd August until 30th August in 2017, again as a two night stay. Contact: islands@welshwildlife.org or 01656 724100 to book.